"I note that several readers have expresses reservations about Isaac’s hard-copies of the research material on the basis of page layout and the sophistication of the word processing. Typically the claim runs along the lines of 'couldn't do that back then.' I find it interesting that some people claim such authority when clearly they do not really know. The fact is this: The Xerox 860 was in wide use in the early to mid-80's as was the top-of-the-line dedicated Word Processor. It wasn't a PC or a general purpose computer though; all it did was WYSWIYG word pro (in fact pre-dating the WYSIWYG feature of the Mac which came a couple of years later). By today's standards it was huge, very expensive and was somewhat complicated to use. I was in the publishing business at the time and we sold newsletters to the accounting and legal profession. They were produced on the Xerox 860 by our dedicated '860 Operator' and resulted in very high quality documents that looked typeset. The layout could be 100% controlled including justification, although the fonts were mechanical font wheels that had to be swapped in and out. The printers were huge and very high-end in quality. (As a note: photocopiers were very high-end even then, although in the mid 80's were still electrostatic/toner based). Given that CARET was 'next door' to XPARC I see nothing unusual in the quality or layout of the documents and any skepticism raised on that account should be declared completely invalid. Here is a link to a reference page re the X860:"
"Looking at the so-called 'documentation' that goes with this stuff, the text-formatting is obviously done with relatively recent vintage page-layout software. You can tell by the perfect nature of the block justification. "That type of extremely precise (even in word-spacing), indeed perfect, text-formatting DID NOT EXIST IN 1985, particularly in a laboratory or even corporate environment. After looking at all of the fancy 'documents,' including the Macromedia Freehand or Adobe Illustrator-designed 'alien diagrams,' I state now and for the RECORD that this whole thing is a HOAX, and will be proven to be such." Another critic wondered why the extraterrestrial diagrams were formatted for 8.5 x 11-sized paper? Other repeated criticism was that if Isaac really wanted the public to see some of the research facts behind the aerial "drones," why did he blacken some of the CARET document text? "This is a big hoax. For one thing, the US Government would NEVER allow this information to left in the hands of some worker. Another thing, the manual does not look anything like a legal NASA or a government document either. 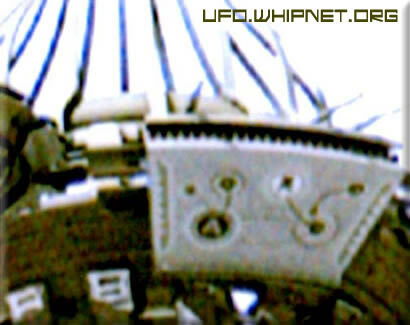 The pictures of the 'artifact' are photoshopped and I can tell you that the aliens DO not label every single part as pictured. The anti-grav unit pictured is fake. The photos of the drone on the floor are model parts. The configuration of all the drones sent in to you and others is something the aliens would never design as all these designs pictured show gross misuse of space. All their ships are based on the use of space. Not one inch to them is wasted and if you look at the history of 'probes' from EBE's they are SMALL and fast. I think you have been had. I am surprised that you and George Noory etc. are easily tricked by this. I would definitely check with your reliable contacts deep in the 'Know' and find out for yourself." I emailed these issues to Isaac and on June 27, 2007, I received his replies in two separate emails indicated by receipt times, which Isaac gave me permission to share in an Earthfiles follow-up. My delay in reporting these emails is that I had an indication from Isaac that I might be able to interview him by phone. So, I waited, hoping the interview would occur. But to date, that has not happened. 1) I realize now that I did not make this clear, but I should clarify that I am not responsible for the blacking out of the Q4-86 report. Most of the copies I was able to make came from documents that were already archived, which meant that they had already been censored for use by outside parties that needed access to some, but not all, of CARET's information. I'm trying to share this information, not hide it, but if I did feel that if a given topic was too sensitive for some reason, I would make it clear that I had personally covered it up and probably try to give a reason why. 2) I do not understand the question about why the diagram would be "formatted for 8.5 x 11"... As I mention in my letter, the diagram is a reproduction, not the original. We had a team of technical artists painstakingly copy the diagram from its original source, which was a slightly curved panel not unlike the one seen in the Big Basin craft, although this one was apparently inside the craft, not on the outside. We copied it into a drafting program over the course of about a month. Our software was understandably primitive by today's standards, but it was still orders of magnitude more powerful than a pencil and paper would have been. This made a task that would have otherwise been nearly impossible relatively feasible, albeit extremely time-consuming. I can assure you, "they" did not make anything particularly convenient for us. One of the reasons we chose to reproduce that particular diagram was because out of all the diagram-artifacts we had access to, it was on the flattest surface. Since the geometry of the forms is extremely important, curvature of the surface it's printed on must be "corrected" if it is to be reproduced in a surface with a different contour (such as a flat page). This can be done in a number of ways, by either using a mathematical model to reverse the effect of the surface curves on the diagram's shapes, or by methods of physical measuring that allow precise measuring of irregular surfaces. In either case, however, it adds a significant new dimension of labor to an already extremely labor-intensive task, so it's avoided whenever possible. We really just needed one or two accurately copied diagrams to serve as convenient examples for our own work in decoding and reproducing it, so luckily this was not something we had to do often. Some experimentation was being done on ways to "scan" the diagrams as well, using an almost completely automated process that could automatically account for curved surfaces, but during my time there, very little progress was made on this front. 3) I think the confusion over the quality of the documents stems from the fact that he (critic) is under the impression they (CARET document) were typeset. They were not. First of all, I'm no guru when it comes to graphics or design, but being in close contact with numerous people from places like XPARC will give you enough background to know the lay of the land. What's first important to note is that systems capable of desktop publishing had been in development for many years before CARET, mostly starting with the Xerox Alto (in 1973), which XPARC developed themselves. In fact, I once remember hearing from someone related to the original Alto team that Boeing (I believe) used the Alto to lay out and print the documentation for one of their planes (or something to that effect, I heard the story years ago). The joke was apparently that there was so MUCH documentation that the plane itself could essentially be filled with the pages. Furthermore, laser printing itself had also been around for many years (albeit in an extremely expensive form), and was also developed within XPARC (more or less). Other systems, such as PERQ and Lilith, also came out around the late 70's and while none of them turned into major commercial products, they were not uncommon among large companies and [mostly] universities and were put to very productive use. These systems were also the inspiration for the Apple Lisa and Macintosh, which was of course perhaps the biggest factor in the consumer-level desktop publishing boom of the late 80's and early 90's. By 1984, there were quite a few options available for producing these kinds of documents, they were just ABSURDLY expensive, so they weren't on every street corner. Obviously it was nowhere near as turnkey and simple as it is today, but it was a very crude approximation of the same process with similar tools. We just had far less features and everything was a hell of a lot slower. But the point I'm trying to make is that while our method of documentation was somewhat advanced for its time, and also somewhat uncommon, it was hardly unattainable by a sufficiently motivated, financed, and well-connected organization. I had very little contact with the technical writers for the most part, but I do know that we were using this kind of technology for both page layout and printing. CARET was expected to produce a massive amount of detailed, well-formatted documentation that could be easily modified and re-used for numerous drafts and revisions, and we would not have been able to keep up using traditional page layout and typesetting techniques. The mid-1980's were a very transitional period for these fields, and I would suggest that people do not assume we were using run-of-the-mill standards. The bottom line is that many people both inside and outside the engineering world frequently underestimate how long we've had a lot of the technology we have. 99% of the algorithms we use today were developed decades ago, they just didn't have the same practical applications immediately available. Most of the engineers of the 60's and 70's would have been right at home with today's developments and technologies. The only difference is that things have gotten smaller and faster. In the vast majority of technologies, that is the only thing that REALLY changes from one era to the next. If I told the average person that we had speech-synthesizing technology in 1936, they probably wouldn't believe me. I could show you a prototype of a simple drafting/design system that was operated by a light pen directly on a screen from the 1960's. You could draw a shape freehand, then immediately rotate it, modify it, duplicate it, or whatever. You could draw lines connecting different objects, then erase them by simply drawing a squiggly line over it. The computer could interpret the squiggles as a sign to erase something, all in real time. And this was half a century ago, and decades before CARET. Think about that for a moment. The point is, most of what we have today is much older than we think. The only differences are that it's faster, cheaper, and a marketing team has given it a glossy finish and found a commercial application for it. But if you take away some of the speed, power, ubiquity and consumer appeal, you'll find a lot of today's technology scattered throughout much of the 20th century. I hope this is helpful. Isaac: "1) While I wasn't a major player in the (CARET) organization, I was hardly 'some worker.' My middle-management position is the only reason I was able to make out with what I did. Bear in mind that even someone in my position would never get the chance to leave with even the smallest of actual artifacts, but paperwork smuggling was feasible for anyone who wasn't subjected to the frisking. Also, let's not forget that paperwork only proves so much. I'll be the first to agree that everything I've provided could be faked, I suppose. It is, after all, just a series of images. While the powers that be obviously don't want this material leaking if they can help it, they're certainly aware that scans of documents aren't in the same league as UFOs landing on the White House lawn. I'm not the first person to leak a document or a photo, and I won't be the last. The information I've shared is very unlikely to change the world, and this is the reason I'm not worried about being literally murdered if I'm identified. I'll face consequences to be sure, but it's not the kind of thing they kill for. 2) Of course the manual doesn't look anything like typical government and military documents. The entire purpose of CARET was to recreate the look and feel of silicon valley private enterprise, populate it with private industry engineers, and let it tackle the problem of extraterrestrial technology research. Style manuals were among the numerous things we brought with us from the 'outside world.' I'm not sure what else can be said about this. I agree it's uncommon for non-standard documents to come out of this kind of research, but it's even more uncommon for people like myself (and even more so for many of my co-workers) to be brought into this kind of project in the first place. Most of us were decidedly not military men. I find it a lot more bizarre than the fact that we were able to design our reports a certain way. CARET was an exception to many of the usual rules. 3) If he (one of many critics who emailed Earthfiles and which I shared with Isaac) believes the pictures are fake, I certainly can't do or say anything to prove otherwise. He sounds very sure of himself. 4) Most importantly, be very wary of anyone who claims to 'know the mind' of extraterrestrials. The comments he's made are, to put it lightly, naive and extremely presumptuous. Firstly, he's referring to 'the aliens' as if there is a single collective group of them. The universe is not split into 'humans' and 'non-humans,' any more than Earth is split up into 'Spanish' and 'non-Spanish' or something equally arbitrary. There are numerous races - and again, like our own races of humans here on earth, they do things in very different ways. His comment that 'the aliens don't do this or that' is akin to saying 'humans don't speak Japanese.' Well, many humans don't, but Japanese humans certainly do. The point is not that his statement is right or wrong, but simply that it's phrased illogically. He then goes on to suggest that the design of the drones is wasting space, which is again, alarming in its arrogance. We had some of the brightest minds in the world spending years just to understand a single facet of their technology, while this individual claims to be able to assess basically every detail of a given design after looking at a single photo and conclude that it's inefficient. I'm not even sure such a statement should be dignified with a response, and I'm sure you can understand why. To be honest, whoever this person is, I wrote him off as soon as he said 'the aliens would never design as these pictures depict.' That's about as presumptuous (if not ignorant) as a statement on this subject can be, at least coming from a fellow human. Unless there's an alien engineer on the other side of this email, there's simply no way such statements could have merit. I'm really only writing this as a courtesy to you. At best, he's been exposed to technology from a radically different race, and at worst, he doesn't know what he's talking about. This individual may have access to real information, and he might not. If he is a fellow 'whistle blower,' then I'm not interested in attacking him. If he's not, and is simply making things up, then I'm even less interested. Whatever he is or isn't is not for me to say, but judging by the way he talks about this issue I have my doubts. It's a big world and these are complicated issues. A sense of humility and the admission we don't know everything is one of our greatest assets.